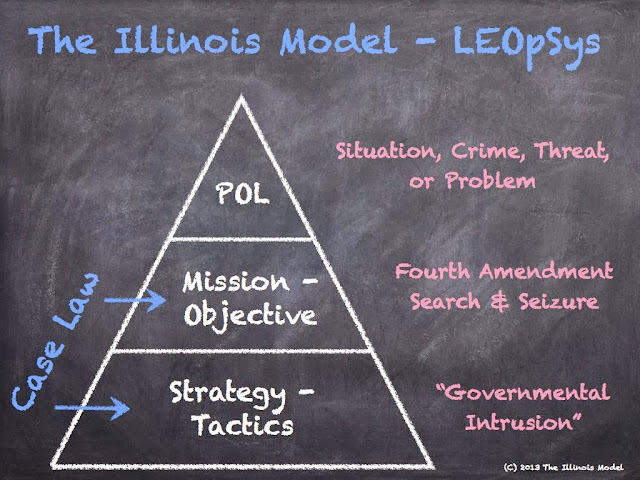 Procedural case law is a critical element of police training. Unfortunately, the bookshelves' worth of cases is confusing, disorganized, and remains un-prioritized. 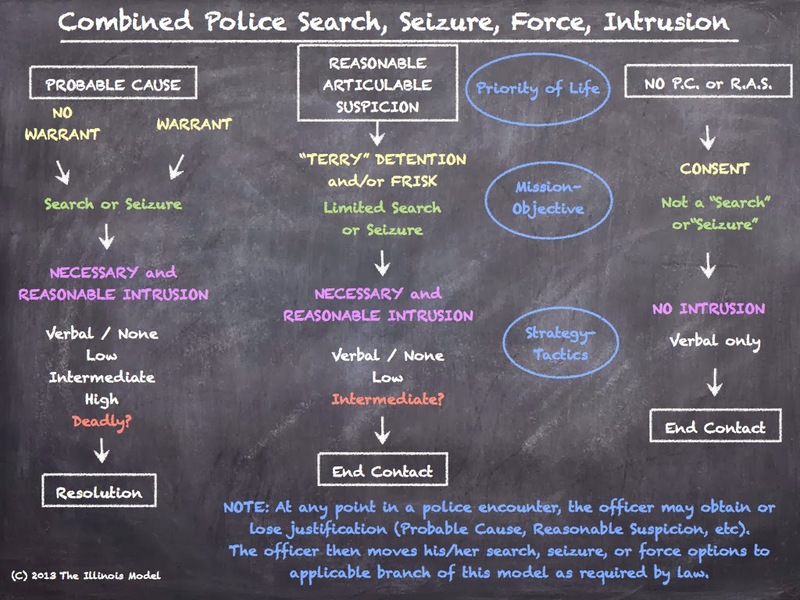 We developed a method to effectively teach case law to police officers so it can be used as "guidance" in the street. We first introduced the below "Combined Police Search, Seizure, Force Intrusion" template in a posting several months ago. Our trainers use it to format their teachings of police case law, specifically issues regarding Search & Seizure and Use of Force. It's also used to explain the growing number of cases where judges are publishing opinions on more general police strategy and tactics. These cases discuss: building entry, use of tactical teams, pointing of weapons, deployment of chemical munitions (tear gas) and flash bangs, and whether officers are creating a more dangerous situation by their positioning, movement, and tactics. A general template for all police interactions. The Illinois Model's top three tiers structure and prioritize case law issues. Identifying the situation, crime, or threats is the first step to solving a problem. Courts continually demand officers analyze the threats to others/community/officer, the seriousness of the offenses, the immediacy of the danger, etc. This is a major theme of search, seizure, and force cases!!! Acting upon lawful grounds, primarily whether or not officers have the power to take action. This is where questions of the search or the seizure arise...and at what level or scope of search or seizure. Conducting the search and/or seizure with a "reasonably objective" amount of intrusion. Government intrusion can be described in terms of: force, speed, aggression, damage, injury, violence, or intimidation. The above list is IN ORDER of importance, from more to less. At any point along this list, an officer can decide that "the juice is not worth the squeeze." Why don't (most!) officers make traffic stops for cars speeding only 2 or 3 miles per hour over the posted speed limit? Because the problem doesn't reasonably justify a seizure. Why don't (most!) cops engage in foot pursuits for jaywalkers? Because even if the cop believes the seizure is just, the amount of intrusion outweighs the need of seizure. Like we've argued in our past postings....the issue of search or seizure is more important than force. We must have a format that assists officers with making solid, lawful decisions in the field. To stick with Pollard's advice, we use BOTH of the above templates. We actually begin with the over-simplified model...then develop the Combined model along with our students on a whiteboard or chalkboard. Then we make it even more complicated....by adding the actual case opinions. Start simple, then add complexity. But start simple!! Any trainer can slavishly regurgitate case after case at a podium. Anyone can make a topic more complicated; it takes someone with a bit more understanding of How and Why to simplify. That person needs to read through the lines until s/he find the concepts, themes, and trends. But in the end, s/he should still use individual cases as examples to demonstrate the interpretations. Teaching case law is about giving guidance to officers. Err on the side of too being broad and there is no practical use. The same mistake is made when being too complicated or detailed. It's a blend of principle and detail. Macro and micro. It takes Tactical Philosophers to develop more Tactical Philosophers. Join us on our journey.